So, bff Stephanie is currently growing two babies in her belly. That's right, twins- a boy and a girl! 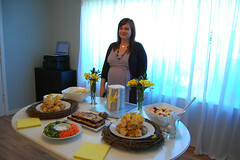 This weekend I hosted a shower for her family and friends. This was the second shower I've thrown for Steph, and this time around she wanted things to be really simple. 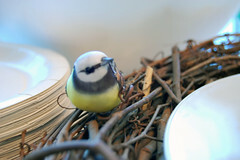 I chose a bird theme that I knew she would love and almost everything else just fell into place. I looked through the archives of a couple of blogs I frequent, namely Oh Happy Day! and Brooklyn Limestone, for some ideas and everything came together really well, I think. 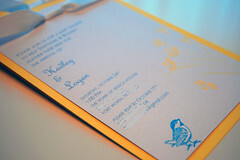 I used some kit invitations that I actually found in the wedding aisles at Michael's, and embellished them with a little birdie stamp to work with the theme. 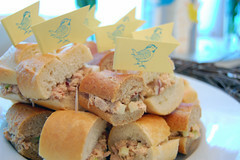 I went with a light lunch-ish menu of tuna and chicken salad sandwiches, kettle potato chips, veggies with dip, fruit salad, and blueberry crumb bars. I had lemonade, iced tea and coffee to drink. 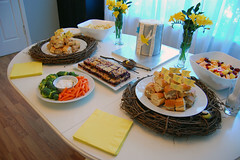 Michael's also provided the grapevine wreaths that I "nested" the sandwiches in, the little birdies that matched my yellow and blue color scheme, the twig & nest combo, and the card stock to make the sandwich flags. I bought two small bunches of delicious smelling freesia for the tabletop and voila! I think everyone had a good time, and Stephanie and her husband Rodney got a lot of stuff that's going to come in handy once little Logan & Hadley get here. Here are a few pics. Oh, and the cake? It was made by Steph. Because she wanted to make her cake, and because she makes awesome cakes. If she hadn't been dying to make this particular cake design then I probably would have done some of those bird's nest cupcakes that have been around the blogosphere and back again. Or talked her into doing it. Because she's awesome. Here are a few pics. Thanks to everyone who came to celebrate the soon to be here babes! Edit: I neglected to thank Josh and Holly for being super helpful with the party prep and even more so with the clean up. They rock! Check out that awesome napkin placement and well-mixed fruit. Whoever did that has some skills. Very nice! Pretty, thoughtful and not overly "twee" - I think it is just right.